And yes, the lack of scale in the photograph is deliberate. We don’t want to make it too easy. It looks like a tuning ‘hammer’ for a keyboard instrument, a harpsichord, a virginals or a fortepiano but is perhaps too late for the Elizabethan period. Looks like a quoin key to lock up a chase for printing? I think so too! A key for locking quoins! Prior to about 1850, quoins were just wood wedges tapped in place with a hammer. There is also a bit missing if that is a quoin key. It’s obviously a corkscrew that has opened so many bottles that its threads have been worn smooth. 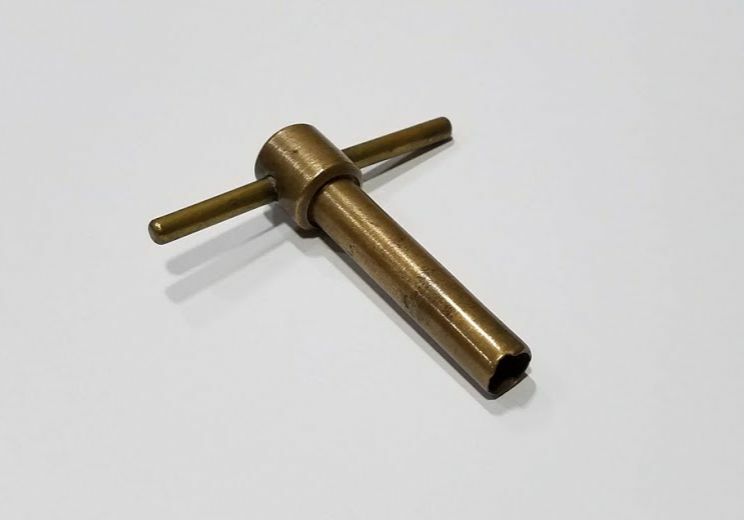 It looks like a key for winding a clock or pocket watch. It’s a cutting tool for putting a clean hole in leather, rubber or similar material. Notice how the cutting edge is worn. Also, the discoloration about a third of the way up from the cutting edge. Most likely caused by debris from the materials the cutting punch cut through. Do I win a crocodile? Appears to be a hole punch, for putting holes in rubber.